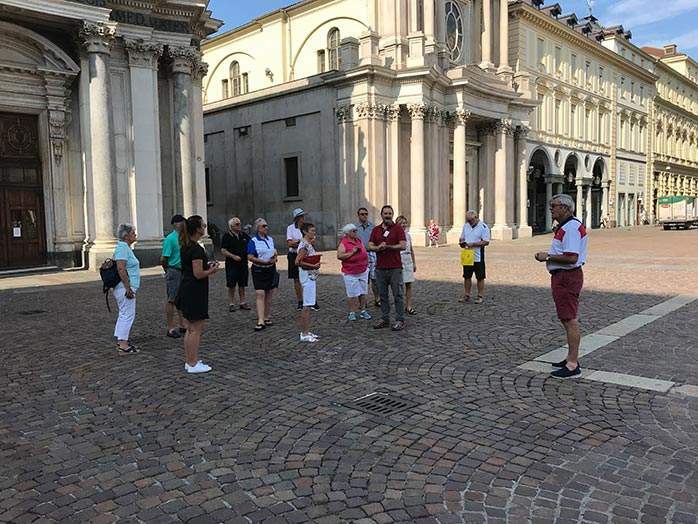 Well, I have been looking forward to showcasing this country and more specifically the city of Turin to a group of 14 golfers who came with me to explore the beauty of this place. I have been there my self on two previous occasions and could not wait to get back. I know that everyone had a cracking time and want to go back again. Flying from Gatwick to Turin at 13:00 in the afternoon and getting to Turin within 1 hour and 30 minutes was only a pleasure. We were welcomed by a very kind man who transferred us to our hotel in a lovely luxury coach that took no more than 35 minutes from the airport to the hotel. We got to the hotel between 16:00 and 17:00 and this left everyone ample time to change and get ready for our first evening meal at a restaurant that was no more than a 5-minute walk from the hotel. The restaurant called Casa Slurp was superb and the Italian cuisine was as expected brilliant. The first day of golf was waiting for us and it was exciting to turn up at Royal Park iRoveri Golf Club, a private members club and to see so little people was like having the whole place to ourselves. The club has two championship courses, namely the Robert Trent Jones Course and the Pramerica Course, both very good and totally different. Being able to see the Alps and surrounded by the mountains was very scenic and a joy to witness. I started off with a clinic on the range and helped everyone with bits of their long game and this was followed by a round on the Pramerica course. In the evening we had our first of 3 evening meals at the Birdie restaurant outside the clubhouse overlooking the course. After breakfast in the hotel, which was awesome by the way, we were met by our guide that took us for a 2-hour walk through the city and introduced us to some lovely sites including the piazzas and some interesting facts and info about the city. This was way too short and the city has lots more in store for us, until next time. Well as you can imagine after day one, everyone was looking forward to seeing the second course and what a course! 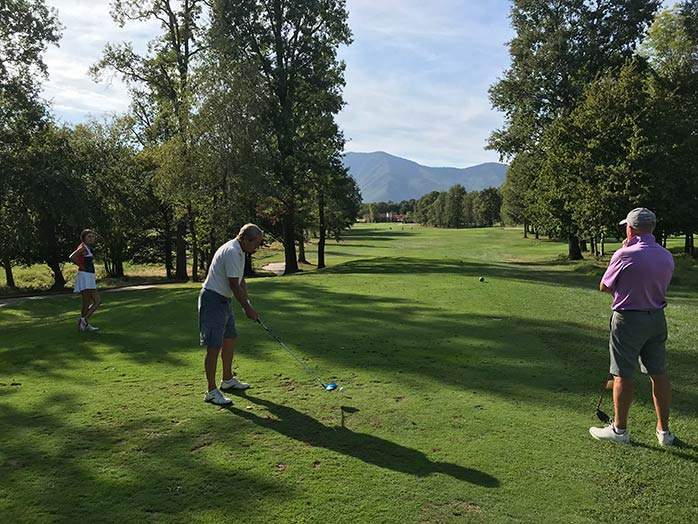 The Robert Trent Jones course was the ultimate experience with fresh alpine water running through the whole course on many of the holes that brought so much stunning scenery to the course. 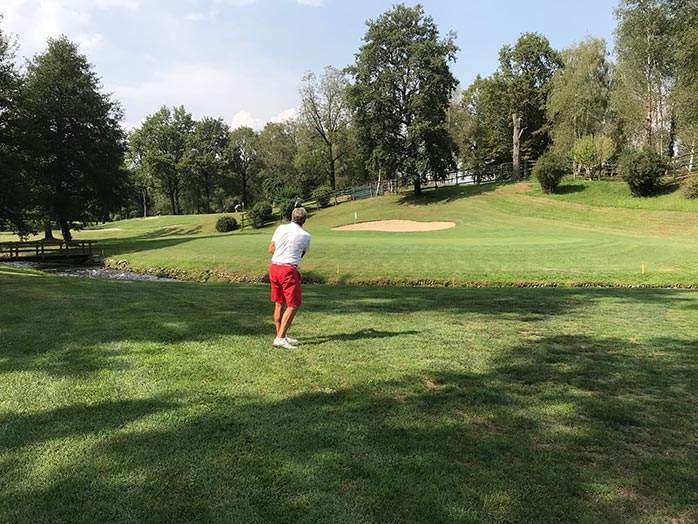 You could clearly see why the Italian Open was hosted here three years in a row and why Eduardo Molinari, brother of Francesco has made this place his home. 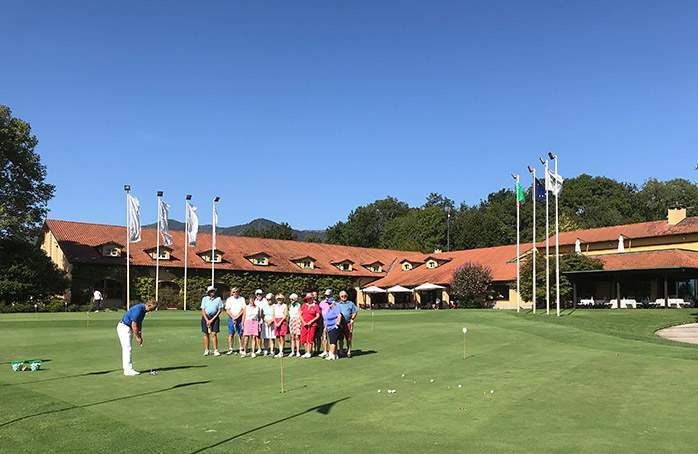 We started the morning again with a short game clinic and everyone thoroughly enjoyed learning more. There was always a break between the clinics and the golf, this meant that everyone could cool down enjoying a snack and drink outside on the club terrace. 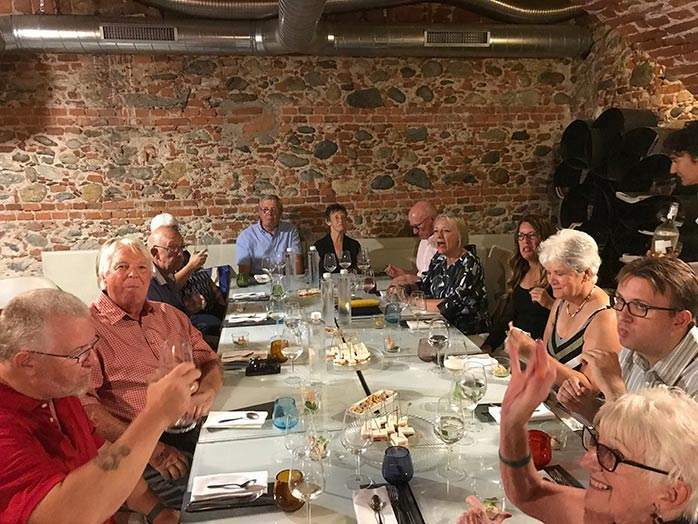 The staff and service at this club were next to none and they could not do enough for the group. Round 3 took place on the Pramerica course again and after playing it once before, everyone enjoyed it more second time around. Like anything to do with holiday golf and playing strange courses, it does take a while to get used to. Another evening meal at the Birdie restaurant was very good and the beauty of eating there was that they changed the menu every day for us and the chef obviously knew what he was doing as the food was faultless. Heading to the course for our final day in Turin and our last round playing the Trent Jones course for the last time on this trip made people realize that it was time to go home, but everybody agreed that they wanted to stay longer and this told me that the trip was a huge success and that I will definitely return next year. I cannot thank our host, Mr Riccardo Colombo enough for his hospitality and I have made a friend for life.